If you wander into a Ford showroom in search of the roomiest, lushest, and brawniest SUV on the premises, you’ve got a big decision to make. Like $13,260 big. 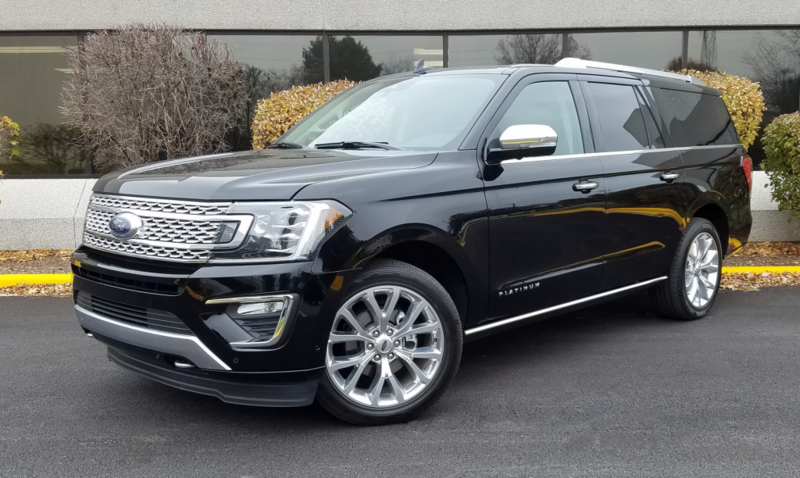 The Expedition MAX Platinum certainly looks the part of a top-line trim level (as it should, considering its starting price of nearly $80K). Twenty-two-inch polished aluminum wheels are standard equipment. MAX versions of the Expedition have 131.6-inch wheelbase and 221.9-inch overall length, which makes them 9.1 and 11.9 inches longer, respectively, than “standard-length” Expeditions. Platinum is the top trim level of three, with the base XLT and midlevel Limited below it. A twin-turbocharged 3.5-liter EcoBoost V6 and 10-speed automatic transmission drive every Expedition, but the version in the Platinum develops more horsepower and torque than the XLT/Limited engine. The Expedition Platinum interior looks and feels appropriately luxurious; if you want it fancier than this, you’ll have to step up to a Lincoln Navigator. Our testers acclimated quickly to the rotary-knob shifter. 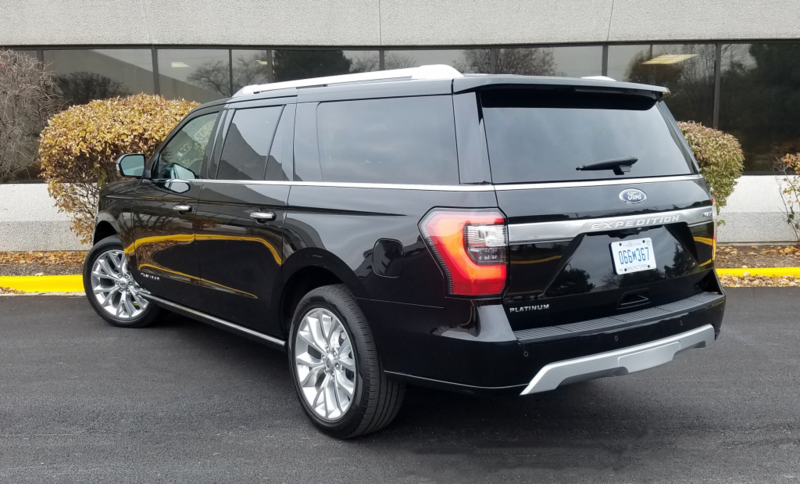 All three Expedition series are available in standard or MAX lengths, and with rear-wheel or 4-wheel drive, so there are price gradations between the Limited and the MAX Platinum, but they represent the clearest points of departure for size, convenience, luxury, and power. Both Expeditions tested by CG were 4x4s. With the second and third rows of seats folded, the Expedition MAX boasts an impressive 121.5 cubic feet of cargo volume. The rear liftgate glass opens separately–a handy feature for quick access to the rear cargo area. The Platinum adds standard features and details that are either optional or unavailable on other Expeditions. The front seats have multi-contour construction with fatigue-reducing “Active Motion” massage functions. Genuine wood dresses up the console, and front-door sills are topped with brushed-aluminum scuff plates. Enhanced active noise control quiets the interior, which has a panoramic sunroof overhead and advanced cargo manager in the back. Drivers can refer to SiriusXM Traffic and Travel Link to help them get around efficiently. 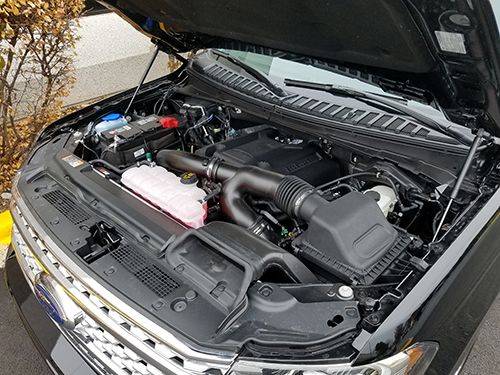 The twin-turbo EcoBoost V6 in the Expedition Platinum gets a 25-horsepower boost over the XLT and Limited trim levels–it puts out a healthy 400 hp. Ride quality is addressed through continuously controlled suspension damping, and the Platinum rolls on 22-inch polished-aluminum wheels. Full LED lighting (with automatic high-beam headlight control) and rain-sensing wipers are included, too. Added driving aids run to an enhanced Active Park Assist System; adaptive cruise control; lane-keeping assist, lane-keeping alert, and driver alert; pre-collision assist with pedestrian detection; and a 360-degree camera with split view. For visual distinction, there are satin-chrome door handles, and satin-aluminum-highlighted grille, mirror caps, and roof rails, the last of which come with crossbars. With 400 horsepower and 480 lb-ft of torque, the test truck was pleasingly eager in the conventional driving mode and almost racy—hard as that may be to believe—in “Sport” mode in normal commuting. The heavy-duty trailering package added to CG’s tester raised its maximum towing capacity to 9000 pounds from 6000. 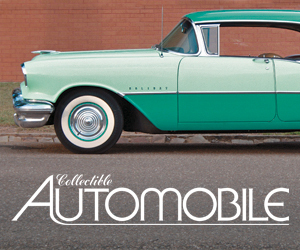 The 10-speed trans operated smoothly on the street and kicked down snappily on the expressway. The EPA rates the MAX Platinum 4-wheeler at 16 mpg in the city, 21 on the highway, and 18 combined. In mostly city driving, we got close to that city figure, averaging 15.3 mpg. Parking this 18.5-foot monolith isn’t a task entered into lightly, but ride comfort is excellent. The MAX’s longer body enables a 16.9-cubic-foot increase in cargo space compared to the base vehicle—121.5 cubic feet overall with all middle- and rear-row seats down. The backs of the 60/40-split third-row seats fold via power switches in the cargo bay. Second-row seats can also be dropped remotely. CG’s Platinum test vehicle had optional second-row bucket seats that folded flat but left gaps in the load floor around and between them. Personal-item storage is equally as ample in either Expedition body type. Passenger room is mostly the same in either configuration. Headroom decreases from the front to the third row, but even most adults sitting in the back row—and adults can sit there—will find plenty of noggin clearance. The pass-through between the second-row buckets is wide enough for easy access to the back row. Soft-touch material covers the dash, much of the door panels, and even the upper sides of the center console. Driving controls are highly legible. A console dial accesses terrain settings to match surface conditions, and is flanked by buttons to call up 2- or 4-wheel drive. 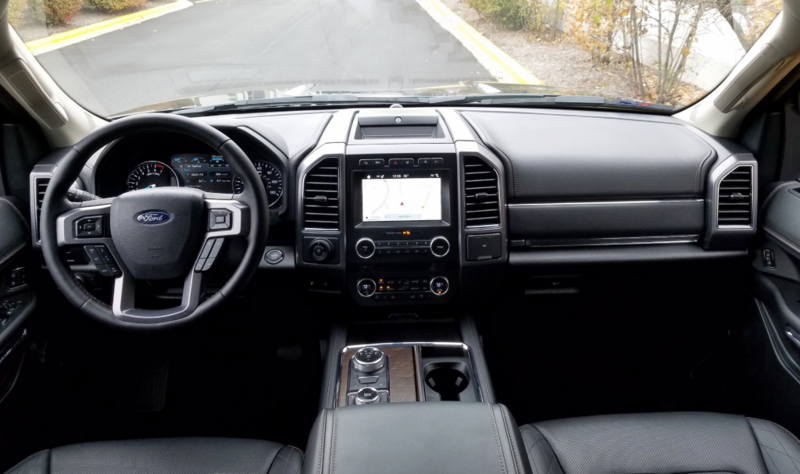 The SYNC 3 infotainment system is easily operable via its 8-inch color touchscreen, and seems to have voice-activated capability that gets things right the first time. Dual-zone climate controls have separate dials to regulate temperature, with less-convenient repetitive-push buttons to handle other functions. With delivery factored in, an Expedition MAX Platinum with 4-wheel drive starts at a considerable $80,160. 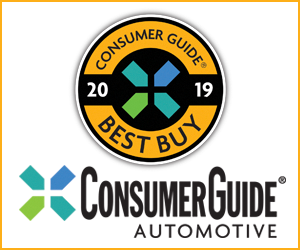 However, with the second-row buckets, trailering package, cargo-floor mat, and rear-seat entertainment system added, CG’s test vehicle settled at $84,505. Speaking of decisions, that seems like a big one. The Expedition MAX is notably longer in wheelbase and overall length than its regular Expedition sibling; this stretch notably improves cargo capacity and rear-seat passenger room, but you’ll pay a significant price premium. Written by: The Daily Drive staff on January 29, 2019.on March 22, 2019.